Help support the Historic Fourth Ward School Museum while you enjoy an educational journey through Virginia City’s Great Fire of 1875. 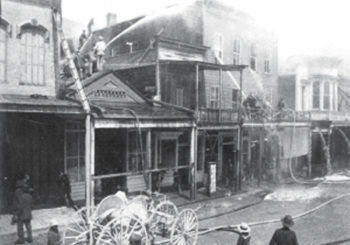 Comstock historian Joe Curtis will lead you through the journey and explain the who, what, when, where and why of the fire that destroyed 75% of Virginia City. Through his personal collection of original source material, Joe will highlight the personal stories and explain why there was virtually no media coverage and no photographs of the destruction. Early bird tickets, purchased before Friday, August 25th, 2017, at 4:00 p.m. are $20.00 each or $15.00 for museum members. After August 25th the door tickets are $25.00 each or $20.00 for museum members. Tickets can be purchased below or by calling (775) 847-0975 ex 1. Your ticket purchase helps support the Historic Fourth Ward School.